Boo! Did we scare you? Halloween is just around the corner, which means that the next couple of weeks will be filled with ghosts, creatures and menacing monsters. With candy and costumes, Halloween is definitely an enjoyable holiday, but the celebration doesn’t have to end there. Halloween can be even more meaningful this year by promoting an altruistic lifestyle and giving back to your community. Check out these 13 spooky Halloween fundraising ideas. 1. Terrible T-Shirts. Everyone loves a great T-shirt. Design some T-shirts for your friends and family this Halloween, then upcharge a small percentage to donate to a cause you care about. 2. Carving Contest. Two words: pumpkin carving. It’s one of the best things about the Halloween season! Host a carving contest and ask participants or attendees to donate to the nonprofit of your choice. Then, let the voting begin and the winner can take a small percentage of the earnings. 3. Haunted House. 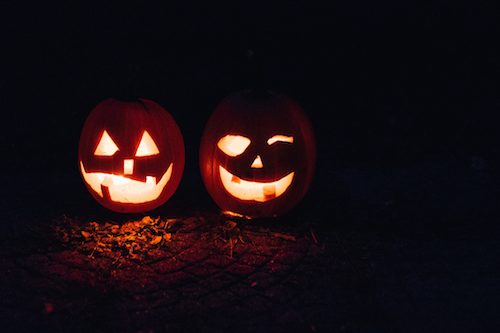 Whether it’s yours, a friend’s, or a neighborhood house, haunted houses are a great way to have fun, charge admission and raise money for your community. 4. Petrifying Party. Maybe haunted houses aren’t quite your thing, but a house party could be. Throw a spooky get together and ask attendees to make a freewill donation at the door. 5. Creepy Cook-Off. Fall food is some of the very best: from pie, to chili, to hot cocoa. Similar to the carving contest, the cook-off could include entry and admission prices, with the winner taking a portion of the earnings, and your favorite nonprofit accepting the rest. 6. Dine and Donation. Maybe your creepy cook-off ends in everyone enjoying a meal the entrants cooked up. Offer a wonderful dining experience to friends and family, with the cost simply being a freewill donation. 7. Golfing Ghouls. You heard us. Put on a Halloween golf tournament for the community and see how much money you can raise for others in need. 8. Candle Collecting. Candles are a great gift this time of year, from the spicy fall scents to the warm glow they make as night draws in. Check out different options available to sell candles and donate the money to a nonprofit you love. 9. Frightening Football. A football tournament is an awesome way to get everyone in the community involved with a little bit of friendly competition. Prizes could be given to the winning team and to the team that donates the most money. 10. Terrifying Trivia. Trivia is very popular these days, so host some terrifying tidbits of your own. You could even make the questions Halloween-themed. All entrants can share a donation with the cause and split the winnings with a community nonprofit. 11. Boo Bonfire. Maybe your bonfire has games, food and other options available. Light up the night and raise some money with a fun community bonfire. 12. Costume Competition. Ah yes, the age old tactic. Costume competitions are always a joy for everyone involved, and are a great way to raise funds for those in need. 13. Trick and Treat. Finally, the big day: Halloween. If you or your little ones go trick or treating, do it with a purpose. Ask for any donations possible to give to a local nonprofit, and see how much money you can raise, while still having a great time. Halloween is definitely a fun holiday, but it can also be so much more. Try out some of these fundraising tactics this year and see how you can celebrate Halloween altruistically.